Are you ready for a quick workout challenge? Today’s workout only takes 15-Minutes Per Round. 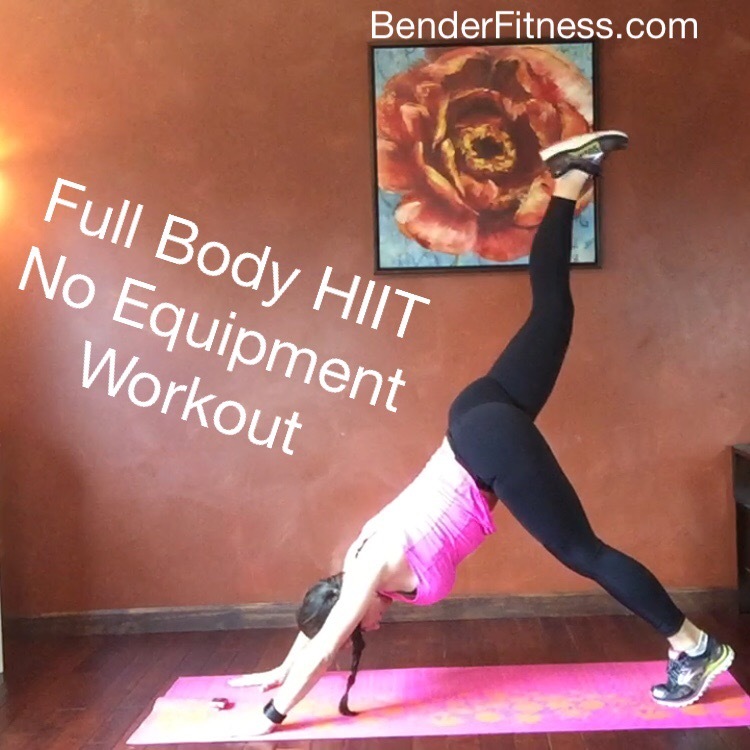 It is a full body workout, and it requires no equipment. Be sure to warm-up first to maximize the benefits of your workout. Warm-ups should always be dynamic (moving) to get your blood flowing and get your body ready to work hard. You actually burn more calories and workout at a higher intensity after a warm-up. I have decided that for the rest of the month I am going to do 10 Sun Salutations per day. This morning I got in 5 before my baby needed me, so I am going to do 5 more this evening. You can check out the video here: Traditional Sun Salutation-Surya Namaskar if you aren’t sure how to do a Sun Salutation and want to join me in the challenge. That link also has a Fitness Fusion variation on Sun Salutations, but I am just doing the traditional version. It is a great full body routine that focuses on both strength and flexibility. Yoga always reminds me to be more present, and focus on form and the mind body connection. Jesse and I also took Maverick outside for a nice walk this evening. We had a busy day, so it felt great to get outside and move! I hope you enjoy today’s workout! If you haven’t checked out Jesse’s video on Proper Running Form you can find it here: 6 Tips for Proper Running Form. PPS Don’t forget to check out my BodyRock Mom workout series on the BodyRock.tv Facebook page Live on Monday’s at 2 PM. Maverick was a special guest in today’s workout, which I did while Baby Wearing. This was great!!! The last set of burpees were tough but pushed all the way till the end. Short and sweaty. Thank you! Maverick is too cute!! Finished your 6 week challenge today. Thank you, it was fun. Having an 18 week old baby & a toddler didn’t make it easy to get my workouts done every day, but I managed to do about 4 a week. My baby is a power napper, so I could only do 1 round most of the time. I actually took before photos the day I started, I still need to loose a lot of weight, but I can definately see a drastic change. Especially my tummy. My husband & I (with kids in pram) started running yesterday. I read your “running for beginners” post & it sure helped. Thank you for that. Going on holiday end of this month & I would love to wear my bikini again! I still hate burpees though! Hi Melissa! Just wanted to thank you for such a great 6 weeks!! I just now finished the 6-week postpartum workout challenge. I lost 8 pounds, and I’m sure a bunch of inches. Sadly I didn’t think to take my measurements, but I will, and then continue onto something else! I’m actually 16 and 13 years postpartum haha (it does not make sense at all that I have 2 teenagers!! ), but I thought this challenge would be a good place to start — it was that and much more. I had gotten so bored with my regular old cardio and workout routines. My daughters sometimes even join me — “you’re working out with Melissa Bender?? I want to do it too!! !” I still struggle with alot of the moves (planks, pushups, squats), but I’ve gotten so much stronger, I just modify where I can and hopefully will work up to more complete movements…I guess I’ll fake it til I make it! Anyway, my question is what do I try next? I know you’ve got all kinds of workouts and challenges on your website, but I’m curious if you recommend a logical next step to build upon what I’ve achieved so far, something that I can follow, a la the 6-week postpartum challenge. Thanks again, you are such an inspiration! My website has an Archive Section that has a monthly breakdown of everything I have ever posted. Let me know if that is what you were looking for, or if you need any more help! I just wanted to say thank you so much for all of your workout videos and advice. I have been following for a long time, but fell off after having babies. I hadn’t worked out for over 2 years and this was just what I needed to get back on track. The past 6 weeks were hard, but I got through each workout. I wondered what you would recommend as a next step? I was going to try your 10-week program. Thanks so much for being such an inspiration! Hi Melissa, Am mom of 2 girls. Aged 4 and almost 1. After my second pregnancy I was weak tired.. had put on lot of weight… Once I decided to get back in shape I stumbled upon ur video on YouTube (postpartum challenge). I started exactly 6 weeks back was religiously following the routine with clean eating. Initially I can’t plank or push up or squat or lunge… I have completed the challenge today. Lot of positive changes in my body and mind. I was 72kg when I started 67 kg now. Lost few inches. I feel energetic, strong and flexible. I was not even able to getup from floor without some one’s help. Now I side plank and get up…. I do plank push ups I do 50-100 squats a day ..Am stronger and healthier because of u. Thank u. Am starting ur 30 day challenge from tomorrow. God bless u and ur family!!! Comments like this….This is why I do what I do. Thank you so much, and thank you for working out with me.